Ghostbusters: Answer the Call #1 Review – AiPT! dd in a series of new weapons from the Holtzman line of ghost-catching arsenal, a super-creepy big bad, and a heaping dose of Kevin and you’ve got a winner. Let me go ahead and get this out of the way: I really enjoyed the new Ghostbusters reboot. It is not a perfect film by any means, but it checks every box one would expect from a fairly well-done reboot of a beloved series. Where it suffered was the predictable sexist backlash mixed in with reboot fatigue. So, if you feel differently about the film, or are upset that I even would bring up the clearly virulent sexist nature of the criticisms about the film (go check out the “super reviewers” on Rotten Tomatoes — where critics gave the film a 74% positive rating as opposed to the 52% from reviewers — if you don’t believe me). 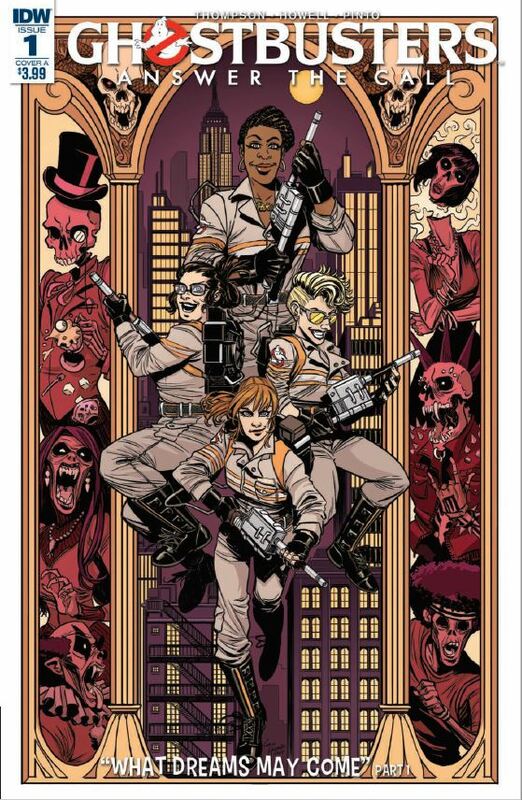 Ghostbusters: Answer the Call #1 is the first in a limited series from IDW focusing solely on the all-female Ghostbuster team. While the ladies appeared in a cross-over with their original universe counterparts earlier this year, this is their first series on their own. Writer Kelly Thompson and artist Corin Howell bring together the ladies who bust in ways that mirror the film’s look and feel, marrying the comedy of the four with the serious ridiculousness of what they face on a daily basis. In particular, Patty channels my inner monologue when confronted by the ghost of a child with a stick and hoop. Avoid ghost children at all costs! My favorite bit of Howell’s work, by the way, is the cover. In the book she nails the look of the characters, the energy of the busting equipment and the otherworldy nature of the ghosts, but the cover design just rocks. The modern take on an art nouveau style has always appealed to me and she strikes a perfect balance with the triptych. It looks like the rest of the series will have similar covers focused on each character and I want them all on my walls. Thompson nails the quick dialogue between the four that seemed to flow naturally in the film. Add in a series of new weapons from the Holtzman line of ghost-catching arsenal, a super-creepy big bad, and a heaping dose of Kevin and you’ve got a winner. The story is formulaic, sure, but this isn’t meant to be groundbreaking comic history here, much like the film. The intent is to explore an existing world in a new way, the same way major comics companies have done for literally decades. I’m really pleased that a new generation gets to explore Ghostbusters in their own universe. I hope that IDW will carry the series, with team intact, into a regular series. Thompson nails the quick dialogue between the four that seemed to flow naturally in the film. Add in a series of new weapons from the Holtzman line of ghost-catching arsenal, a super-creepy big bad, and a heaping dose of Kevin and you've got a winner. Great characterization and I love the cover!